After a full on week at work I was keen to get back to Cairns and head down south to Mission Beach with Cass and a few good mates for the long weekend. The weather was going to be pretty average, 20-25 knots, about 2m of swell and overcast but we decided the reef would be our best bet as the visibility around the islands off Mission Beach would be pretty poor. We left Cairns Friday afternoon and the weather was absolutely horrible.... Cold, wet and windy! Why is the weather always crap over long weekends?? When we arrived at our house in Mission the weather wasn't any better so the decision was made that Saturday would be a day to relax, put some crab pots in and check out the islands while Sunday would be the day to head out to the reef, rain, hail or shine! Saturday was pretty uneventful. We dropped the pots in and headed out to Dunk Island for a look as it was one of the hardest hit areas by Cyclone Yasi. The resort was a mess! It was pretty sad to see it in such a state as only a few months before some of Cass's friends were married there and the photos from that looked amazing! We stopped off at one island to have lunch and set the boat up for a ski but conditions were less than ideal. Overcast, windy and cold.... I thought this was a tropical paradise?? We returned home after checking the pots which produced no legal crabs and started preparing our gear for Sunday. Sunday morning we woke up and there was not much wind blowing at all. We launched the boat and headed out to Farquharson reef about 20nm from the boat ramp. Conditions were better than we expected although it was still overcast and windy but only about 1m of swell. The first spot we dived was about 8-10m. A good warm up spot (although the water was only 21 degrees... Lucky I had my 3.5mm Beuchat Mundial Camo wetsuit) and with plenty of bommies around I was on the lookout for a few crays. After 30 mins and seeing nothing but a big Humphead parrotfish, a Chinaman and a few trout I headed back to the boat. Rob came back minutes after me with a nice Mangrove Jack and Blackspot Tuskie while Quinn had a nice sized Painted Crayfish. For the next 2 hours we dropped in at other spots but nothing was holding any decent fish and the visibility was barely 8m. After this we pushed out to the front edge where the reef dropped away to 30m+. Quinn and I jumped in and vis was still much the same. 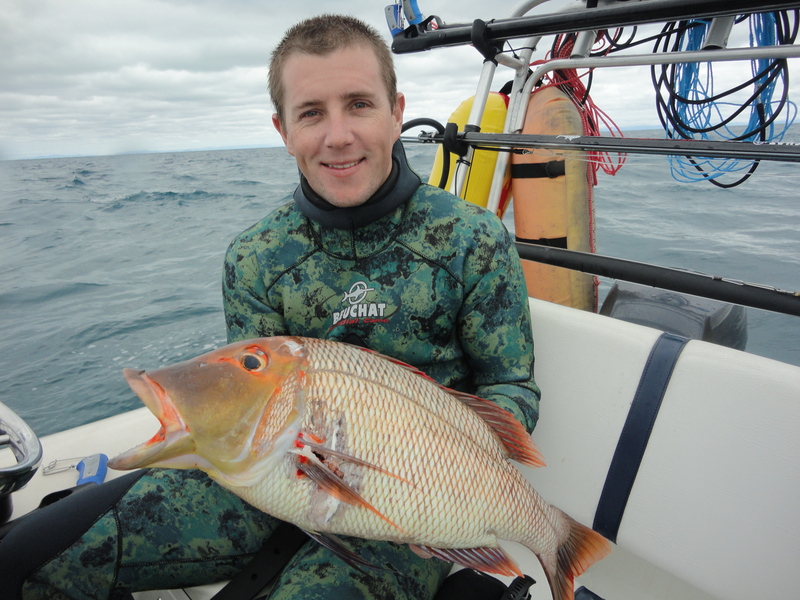 As we swam along, Rob burleyed up and the bait schools were going crazy but still nothing decent. I saw a good sized Trout, dived down and after a squeeze of the the trigger had some dinner at least. We kept drifting along and I spotted a big GT swimming in and out of a hole so I turned on my GoPro and dived on him. He was on to me straight away so I kicked hard after him waiting for him to turn slightly, pulled the trigger with the shaft hitting him high in the tail. He was off like a steam train and not stopping in a hurry. I tried not to apply too much pressure as I didn't know if the shot would hold. After a decent fight I finished him off with my Beuchat knife and was happy to swim him to the boat and put him straight into the esky. Some people don't rate GT as a good table fish but one thing I know is that most people can't tell the difference. I love shooting them as I know they put up one hell of a fight and feed a lot of people. After a quick snack break and a good drink of water I grabbed some more burley and swam over to rob who was waiting on the drop off. I burleyed up and rob took the first dive. Nothing. I breathed up and dived down to 16m and spotted a nice Red Throat Emperor looking straight at me. 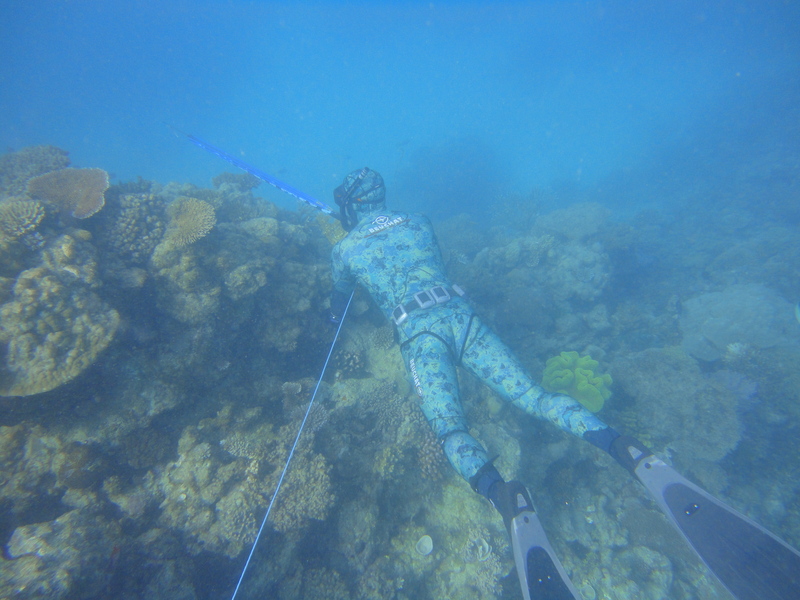 I followed him and when he swam above the reef I fired a shot right behind his gills so as not to damage my shaft. When I got to the surface I pulled him up only to see a 25kg+ Spanish Mackerel swim straight under me but I was pretty stoked with my RTE as this was my first one. I haven't been spearing for that long so there are still a lot of fish I am ticking off my list and I believe in quality not quantity! On the way home we dived the shallows which produced a few nice Trout and some HUGE crayfish. I was stoked as I am cooking a big BBQ dinner for Cass's Birthday next break and I had promised 25 people that there would fish and crayfish. 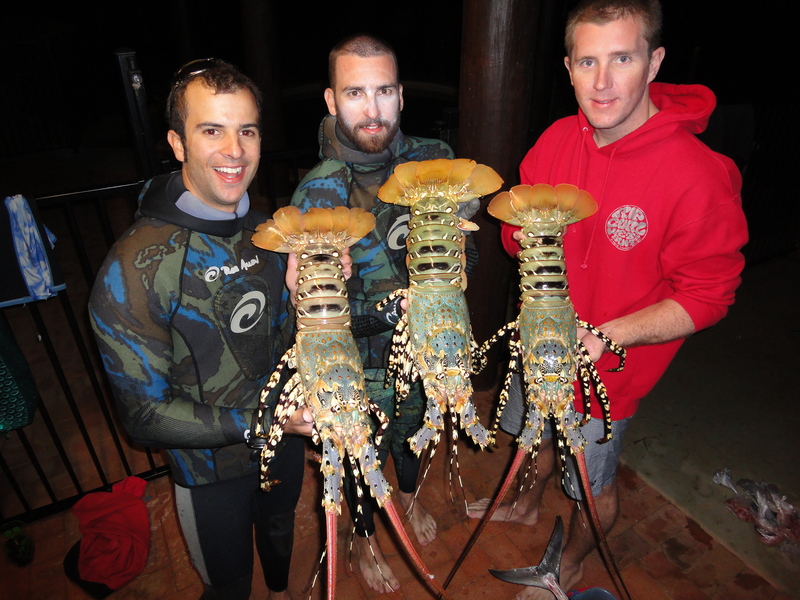 Apart from the weather the trip was awesome and I am lucky to have such good mates to dive with. I was also lucky enough that last time I was at Adreno, Robbie lent me a Beuchat Carbon 115 that was signed and used by 3 time World Spearfishing Champion Pedro Carbonell when he was in Australia. This gun was perfect for in and around the reef and was also deadly accurate as I managed to stone both the trout I got in the shallows.